Plock is the original block busting Facebook game which is now available in the App Store. The Simple and addictive gameplay in Plock is an unfussy variation on block matching games. It takes a lot of rapid fire tapping and fast eye hand coordination to get higher scores each time, trying to beat out your personal best. There are people in the OpenFeint leaderboards for Plock with over 4.5 million points in classic mode, which is just unbelievable to say the least. If you’ve played Plock on Facebook, you’ll find the iPhone version of Plock more effective in terms of just gameplay using touch-based controls instead of a mouse. 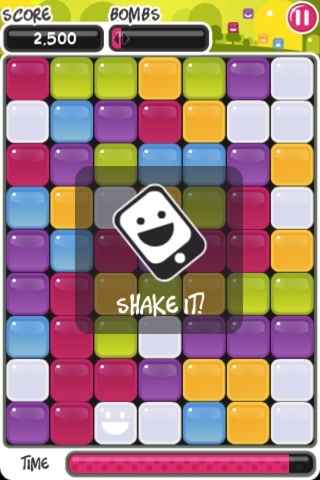 You can even shake your iPhone if you get stuck and you’ll get a new set of blocks. While not the most cerebral of the matching games out there, Plock is still fun and addictive. You have 1 minute to score as many points as you can. Tap any 2 or more matching blocks to clear them and fill the bar, which when full gives you a bomb. You also earn score multipliers through the game. There is not a whole lot of logical thinking or deep concentration needed to play Plock. It’s really just a lightweight speed filled block buster. You can pretty much just tap anywhere on the iPhone screen repeatedly and you’ll randomly be right and break blocks. Add a bit more concentration than random and you can find matching pairs quite easily. With a tiny bit more effort, you’ll also be able to rack up enough breaks in a row to earn those exploding bombs. When the bombs blow up the iPhone vibrates which adds to the effect. The music is playful and speeds up towards the end of the minute time. You can either play in survival mode and go from level to level, or play the classical mode and try to get a higher score each time. Overall, Plock is fun, colorful, fast and slightly addictive. If you’re into the tap tap revenge games, or just love beating your high scores, Plock will appeal to you. AppSafari review of Plock was written by Joe Seifi on February 15th, 2011 and categorized under App Store, Fun, Games, Puzzler. Page viewed 4137 times, 1 so far today. Need help on using these apps? Please read the Help Page.